Grand Opening of EL COQUÍ!! Chef Anthony "Tony" Banegas brings to Portland all the traditional flavors of his native home town Puerto Rico. The coquí is a small frog native to Puerto Rico, which became a cultural symbol for Puerto Ricans. EL Coquí's bold Puerto Rican flavors will make some serious noise in the food scene in Portland. Tony will delight us with one of the most popular Puerto Rican dishes, Mofongo! which is made with fried mashed green plantains molded into the shape of a bowl and stuffed with pork meat, seafood or chicken. There will be other traditional Puerto Rican small dishes like pinchos (skewers), empanadillas and bacaladitos. For the grand opening El Coquí will present the music band ACHE SON and the congas of Miguel Medina. Join us for the third annual Taste of Latinoamerica, a food and cultural festival in the heart of Southeast Portland! Join us for another annual Taste of Latinoamérica Festival, this September 9 at the Portland Mercado. Support more than 20 Latino start-ups while taking part in the food, drinks, and cultural activities from across Mexico, Central America, South America & the Caribbean Islands. Bring your familia out for a day of live music, dancing, art, kids activities, an open air bar, and more! ¡Únase al Festival de Sabor de Latinoamérica el 9 de Septiembre en el Portland Mercado! Apoya empresarios nuevos Latinos y explora los alimentos, bebidas, y actividades culturales de varias regiones de México, América Central, América del Sur y las islas del Caribe. Toda la familia podrá disfrutar de música en vivo, un bar a aire libre, baile, arte, actividades para niños, y más. ¡Este evento es gratis y abierto al público! Este evento es apoyado por la asociación con Travel Portland, Portland'5 Center for the Arts, Prosper Portland, Scott Edwards Architecture, AAA, Comcast, United Way, y Hacienda CDC. We are hosting a holiday party in December! 2 days, vendors, specialty drinks and foods, a posada, live music y mas! ¡Felices Fiestas! We are hosting a holiday party in December! 2 days, vendors, specialty drinks and foods, a posada, piñatas and more! ¡Felices Fiestas! Come check out the new Portland Mercado businesses Haitian Cookshack Cafe and Carniceria Kaah, as well as your staple favorites. 4:30-7 Marimba Primaveral de Guatemala Live Music! Finish out the year in our new market hall design with a Pop-up Dinner organized in partnership with Barrio and Pozole to the People! 5 Courses including wine for just $40! 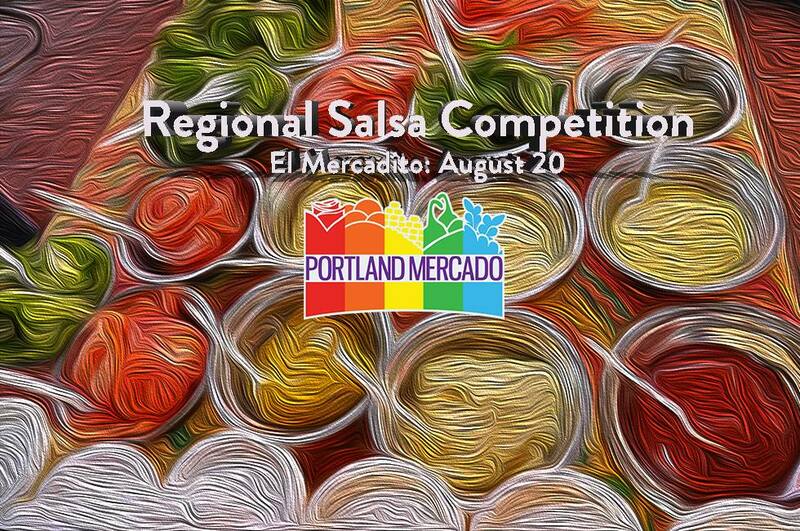 To reserve your space contact info@pozoletothepeople.com or register in person at Barrio here at Portland Mercado. Grand Opening of Two New Businesses! What happens when you blend a grand opening for two businesses, one from Haiti and one from Guatemala? You'll have to come explore for yourself to find out! Carniceria Kaah is Portland's traditional Latin American Butcher Shop with housemade treats like carnitas and chicharrones. Jouk Li Jou Haitian Cookshack Cafe combines local ingredients with caribbean influences into well-balanced eats. Vegan and Vegetarian friendly. Micro Mercantes is our business development services and kitchen. More than 50 entrepreneurs are currently benefiting from their services and several of the Mercado businesses have as well. Join us for a night of food, networking, drinks and to learn more about and support the heart of entrepreneurship at the Mercado. Ticket includes a drink and snacks from Spice of Africa, live music from Oscar Tito Amaya and more! Come celebrate a diverse community of musicians is back to bring a community Brazilian a samba & pagode gathering at Mercado. Host Peter Fung will start the evening with Chorinho, following by some Bossa Nova, ending with the samba de roda. Bring your instruments and join the fun! Open and Free to the public! GRACIAS PORTLAND! We received over $15,000 in donations from individuals and businesses in our community to help us recover from our vandalism on October 24th. As this far exceeded our expectations, we are inviting you to the Mercado to say GRACIAS by sharing a meal with you. Starting at 4pm The first 200 people to come will be given gift cards to be used at your business of choice. Join us for a late afternoon of friends, family, food, live music and happy hour at Barrio. Join us to celebrate our ancestors and the continuation of life at Dia de Los Muertos weekend. This event is sponsored by Oregon Health Insurance Marketplace whose mission is to make sure all Oregonians have access to health insurance. A special evening of live music with Cilantro and Oleada. Barrio stays open later. Bring a flower, candle or ofrenda for our community altar. FREE with drink or food purchase. +Trick or Treat all day with businesses! +Bring a candle, flower or ofrenda to contribute to our community altar. Kick off Halloween and Dia de Los Muertos weekend with us at Portland Mercado as Cilantro and Oleada play a special evening show in the market hall. Cilantro is celebrating the recent release of their new album "Intensidad". Free with food or drink purchase! Barrio will be staying open later than usual to accomodate this special evening. Join us at our Final Mercadito! It's been a great pilot and this will be the final opportunity of the year to support the vendors. Since October means preparing the altar for Dia de los Muertos and Halloween, we are having a pinata festival. Come fmake your own pinata, help others crack one open enjoy a performance Urban Love 4 Art. Come out to support our local neighborhood Brass Band Montavilla Brass! Live music in the plaza is always a great way to finish out the week. Hear the music from Barrio or in front of the food carts. Join us at Barrio for Music Monday's as we welcome local musicians Freddy Trujillo and Josue Santiago de Leon to perform a special acoustic set. Freddy Trujillo is a singer/songwriter/bassist who played with Pat Smear (Nirvana, Germs) and many other local L.A. acts during the explosion of punk/alternative music that hit L.A. in the '80's/'90's. Freddy now lives in Portland where he released his acclaimed debut solo record Hawks & Highways, which dealt with the intertwining of Native American and Chicano experiences in rock & roll form. Josue Santiago de León is originally from Jalisco, Mexcio and is the lead singer for Portland rock group Los Perros Olvidados. Josué is a photographer and has released recent tracks from a solo tour he took across Mexico and the southern United States on his motorcycle. Join us at Barrio on Monday August 22nd to hear these two local musicians bring us the best of that chicano sound and lifestyle. Come visit Portland Mercado for Oleada on 6/20 for an evening of rhythms based in Latin American chicha and psychedelic grooves. Think you have some of the best salsas in the region? There will be 3 categories, each prize takes home $100! Customers get to vote for the winners! Every third Saturday of the Month, join us at Portland Mercado from 10am-6pm for El Mercadito, a mini market for small-scale vendors in food production, arts and crafts. Confirmed vendors include businesses producing foods in Micro Mercantes Kitchen and local artisans from our diverse community. Join us at Portland Mercado to meet and greet Colombia's favorite and most famous salsa bands who are here to perform at Festival de la Salsa underneath the Hawthorne bridge later during the evening. We will have a DJ and will be giving tickets to attend Festival de la Salsa where Grupo Niche & Sonora Carruseles will spice up Portland! Instrumental Nuevo Flamenco sounds in our plaza, near BARRIO. Enjoy wine and relax to Art Viloria. DJ Karla Sanchez is from Peru and will spin worldly Latin beats in the evening. The date was chosen strategically as it is in between Colombia and Peru's independence day. Come grab some food at Que Bacano and enjoy summer in our plaza. We are on the trail as a family friendly stop for the Foster Street Pub Crawl. The journey begins at Starday Tavern. COPA AMERICA TOURNAMENT AND KICK OFF PARTY! Join us at Portland Mercado for all of the COPA AMERICA games. As long as the times fall within our normal business hours of 10am-9pm, games will be shown. We will kick off the 3 week tournament with a viewing party as Colombia battles the USA at 6pm on Friday June 3rd. Copa America tournament is June 3rd -26th. If we are open and do not have a special event, we will show all of the games. Estamos muy contentos de anunciar que vamos a mostrar el mayor torneo de fútbol --COPA AMERICA de América Latina --¡En la sala del mercado durante el mes de Junio! Vamos a dar inicio a las fiestas y el torneo el viernes 3 de junio a las 6:00pm en la sala del mercado y ver como los EE.UU. le gana a Colombia. Join us at BARRIO to taste some of the best pinto from one of Oregon's only known Latino winemakers, Jesus Guillen of Guillen Family Wines! As an award winning viticulturist, Jesus has been making pinots in the region for over 12 years. Venga al Mercado el 14 de Mayo a una feria de trabajo para conocer las oportunidades disponibles con las empresas del Mercado y otras oportunidades con la Agencia de Empleo “Cody Staffing”. Hay posiciones para personas bilingües e hispanohablantes en muchas industrias. 11 a.m.-2 p.m.
Come out to the Mercado on May 14th for a job fair to learn about career opportunities with businesses at the Mercado and other opportunities with Cody Staffing Agency. There are positions for bilingual and Spanish speakers in many industries. 11am-2pm.